When you listen to this single, it's hard to believe that both tracks were composed and performed by the same man. The A-side is an exciting, upbeat affair, whereas the B-side is rather bland and middle of the road. 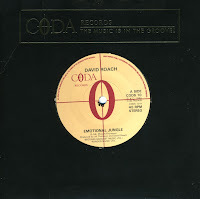 Longtime readers of the blog, however, are already familiar with these two tracks, as the 12" single of 'Emotional jungle' was featured here ten months ago. 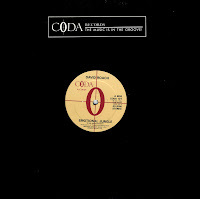 I had the 7" single four years before I found the 12" single. Again, it was my sister who discovered David Roach. His 'Emotional jungle' was a great, but very obscure, track. David's album 'I love sax' was in the UK album chart for one week, and the single never even reached the singles chart. My sister bought a copy of the single and we played it for weeks on end. Later on she also found the 12" single. I had to wait for a long time until I located the 12" myself: eleven years to be exact. Finding a rare record like that is always a triumph.